You'd be barking mad not to try it! Often things you are already interested in will make brilliant fundraisers. If you have a passion or hobby then look to see how you can turn it into a simple fundraising idea. A good example of this is organising a charity dog show. 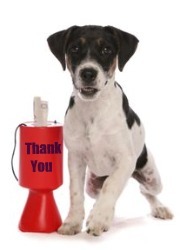 Holding a charity dog show is not difficult if you keep organised and get a good key team of helpers around you. They can be a lot of fun and make great fundraisers for all sorts of different non-profit organisations. A good venue is important. You will need plenty of space and an outside area is best if you can count on good weather. Village / school halls with access to a playing field are good choices. Marquees are another option but expensive. You will also most likely need good parking facilities for spectators and competitors. You need to decide how serious your show will be. More serious shows use qualified and experienced judges. Fun dog shows are just that and taken less seriously by all concerned. With either however you need to plan out a good show programme with the right number of classes etc. Make arrangements for dog water to be provided at a number of places and make adequate poop provision. Most people are fine about clearing up behind their pets these day but do ensure there is somewhere to put this. Have plans in place for how you are going to advertise your fundraising event and attract competitors and spectators. Again this depends on the nature of your show. Best Rescue Dog - Any dog that has come from an animal shelter. The important thing with planning your classes is to try to encourage owners to enter their dogs in as many categories as possible. Dog agility classes are often included at dog shows but usually as an interesting novelty. Owners are invited to let their dogs have a try-out at various challenges such as walking along planks, over hurdles or in and out of sticks etc. These competitions are usually just a bit of fun and an added attraction to your fundraising event. You may however like to consider inviting your local dog agility club. These clubs are often keen to demonstrate the skills of their pets and regularly feature in all sorts of summer fundraising events. For prizes some pet food companies may be worth approaching directly and will sometimes offer little gift packs etc. Check their websites for contact details but allow plenty of time to set up any deals. Smaller items may also be "cadged' out of local pet store or other local retailers. They don't have to be dog related. Rosettes, not just for the winners, but for all those taking part are a great way of keeping everyone happy. Judges can usually be found amongst local dog breeders or vets. For the less serious classes a local character or dignitary will usually be fine. You can make more of your event and sometimes raise additional funds by inviting suitable experts and companies. These can either provide simple demonstrations or have a stall to market their services or wares. 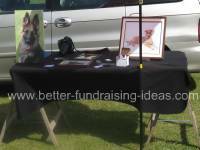 Don't forget too to have a few sidestalls busy raising extra funds for your group. Tombolas and raffles are simple to set up and run. A few other fete activities can be given a doggy theme. How about doing a version of the Treasure Island game called "Find the Bone" or Guess the Name of the Puppy (soft toy dog). Another simple one would be Guess The Number of Dog Biscuits In The Jar. Entry fees for competitors - You will make money mostly from entry fees into the different classes. A few pounds / dollars per class soon add up. To encourage take up of additional classes you may like to have a fee for the first class entered and then less for any subsequent class entered by the same dog. Sponsorship and advertising - Try to find some local companies willing to sponsor classes and offer advertising space around your show and on your programmes / list of classes etc. Sidestalls - Charge a fee or commission to relevant businesses. 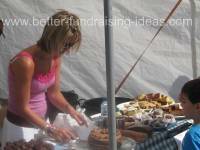 Refreshments - There is a lot of money to be made in refreshments and it is an easy way to turn events into great fundraisers. Keep it simple with teas, coffees and cold drinks. Home-made cakes, biscuits and sweets will also prove to be winners. If you want to be a bit more adventurous a barbecue can also be a good earner . Don't forget the ice creams, either set up a scoop station yourself or take a fee from a professional who wants to attend. Dog Shows really do make great fundraisers. Are always the best. So go on give it a try. You'd be barking mad not too!! Are you looking to raise money for animal protection groups or shelters? If so we thoroughly recommend this great book by Susan Daffron. 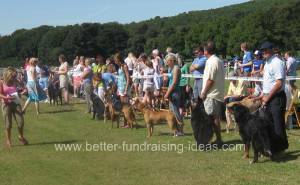 Its full of practical no-nonsense advice about promoting and marketing your group or cause: and then has a whole list of neat fundraisers, many with a dog related theme. An excellent book for anyone looking to raise money for animals of any kind.